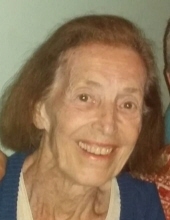 Alice J. McMahon (née Artim) of Highland, IN, age 86, passed away peacefully April,3 2019 surrounded by family. Alice will be missed by her son Brian and his long-time girlfriend Agnes Lasics; sister: Phyllis Beckman and brother: “Bud” and Julie Artim; plus many close nieces and nephews. Alice will be joining her husband: “Jack”; parents: Ralph and Josephine; and other family members in Heaven. Alice was a graduate of Morton High School, 2-year Saint Mary's College, Notre Dame alum, worked in the family business (Artim Trucking) before marriage and full-time homemaker. She was a Junior Association member, a longtime supporter of the “Share Foundation” and the Hammond Optimist Club. She was a long-time member of Our Lady of Grace Parish in Highland. She enjoyed shelling, was an avid collector and enjoyed many sunsets on Marco Island! Visitation with the family will be on Sunday April 7, 2019 from 2-7 PM at Burns-Kish Funeral Home, 8415 Calumet Ave Munster, IN. Services will be on Monday April 8, 2019 at 10:30 AM at Our Lady of Grace Church, 3025 Highway Ave. Highland, IN with a visitation one hour prior to the mass. Interment will be at Elmwood Cemetery, Hammond, IN. In lieu of flowers donations can be made to The Share Foundation with the handicapped, P.O. Box 400 Rolling Prairie, IN 46371 or Alzheimer’s Association, 225 N. Michigan Ave. Chicago, IL 60601 Floor 17 in her loving memory. To send flowers or a remembrance gift to the family of Alice J. McMahon, please visit our Tribute Store. "Email Address" would like to share the life celebration of Alice J. McMahon. Click on the "link" to go to share a favorite memory or leave a condolence message for the family.